Empower your Web site or software with realistic 3D text. Generate impressive banners or 3D navigation buttons with ray-traced three-dimensional text complete with realistic shadows and reflections. Design flyers and brochures with innovative style with high-resolution 3D text. 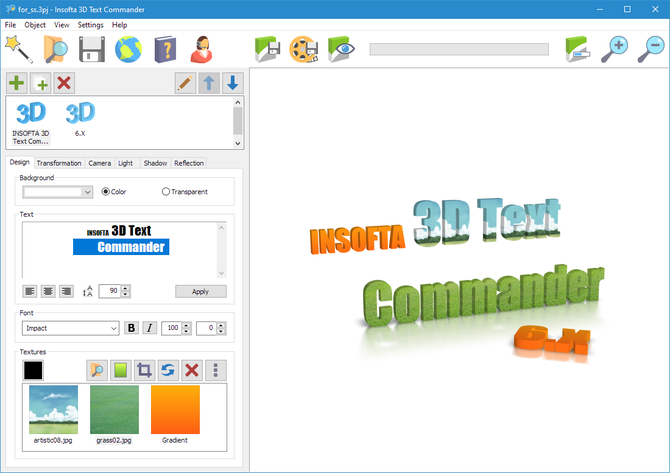 Insofta 3D Text Commander easily does all that, and more! No complex settings and no learning curve are involved thanks to the visual controls working in real-time. Not sure exactly what you need? Start Insofta 3D Text Commander, and a step-by-step wizard will guide you through the creation and configuration options in less than a minute. Want to create an impressive headline or logo without a lot of design? Just follow the prompts, and you'll have your own unique image with 3D text created on the fly. Insofta 3D Text Commander supports two impressive effects: smooth shadows and reflections. Of course you could create a shadow in Photoshop, but would it be in 3D? Sure you can make a reflection in 3DS Max, but are you prepared to spend days and weeks learning? Insofta 3D Text Commander creates realistic, three-dimensional shadows and reflections with just a few mouse clicks. The effects look stunning, and can be used to create impressive 3D banners or headlines. Have a near-perfect image that's missing that special 'thing'? Adjust the settings by moving sliders, and see your 3D text change in real-time! Insofta 3D Text Commander renders so fast that there's no delay between adjustment and result. Unlike the competition, Insofta 3D Text Commander does not limit your creativity to banner-size images. Create flyers, brochures and other printed matter with hi-quality 3D text on the cover. Insofta 3D Text Commander produces images up to 4000x4000 pixels, which is sufficient for printing on letter-size paper in typographic quality. Changes: 'Save Image': When you save a custom-size image while preserving the proportions, the main size (width or height) is also saved. Now size include paddings. CMYK JPEG support added. Command-line parameters changed. Added ability to duplicate, change the order, rename 3D text objects. Minimum requirements: Approximately 20 MB of free disk space. No additional system components are required. All copyrights to Insofta 3D Text Commander are exclusively owned by Nail Sagitov (Insofta Development). The Insofta 3D Text Commander trial version may be freely distributed, with exceptions noted below, provided the distribution package is not modified. No person or company may charge a fee for the distribution of Insofta 3D Text Commander without written permission from the copyright holder.